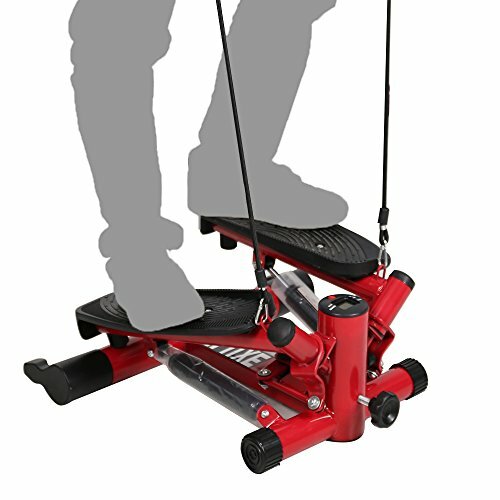 Stepper training is a good product，It offering a full cardio workout,strengthening your muscle,this air climber can help you get a shapely and toned body as well as full body workout. With our resistance bands exercise together to have a good shape of arms, waist, belly, buttocks and legs. Just 30 minutes of aerobic exercise each day can help keep your heart healthy and your weight under control. Comfortable Wide Anti-slip Pedals Its non-slip pedals ensures safety, you can feel an obvious resistance of climbing a mountain. In the meanwhile, its buffer and steadiness protect your knees and ankles from getting injuried. The informative LCD training display circularly shows time, scan, rep count, total count and calories burned during your workout. The overall size of this stepper saves much more space than a treadmill. Also, its 20Lbs weight makes it portable to be taken to anywhere. Its weight capacity is 220Lbs. Offering a full cardio workout,strengthening your muscle,this air climber can help you get a shapely and toned body as well as full body workout. Comfortable wide anti-slip pedals,safe and durable， its buffer and steadiness protect your knees and ankles from getting injuried. Digital training computer measures the steps,time and calories,making your exercise more reasonable and effective. With our resistance bands exercise together to have a good shape of arms, waist, belly, buttocks and legs. Overall Size：22x19.7x8.3 inches ; Maximum load: 220 lbs，it saves much more space than a treadmill.